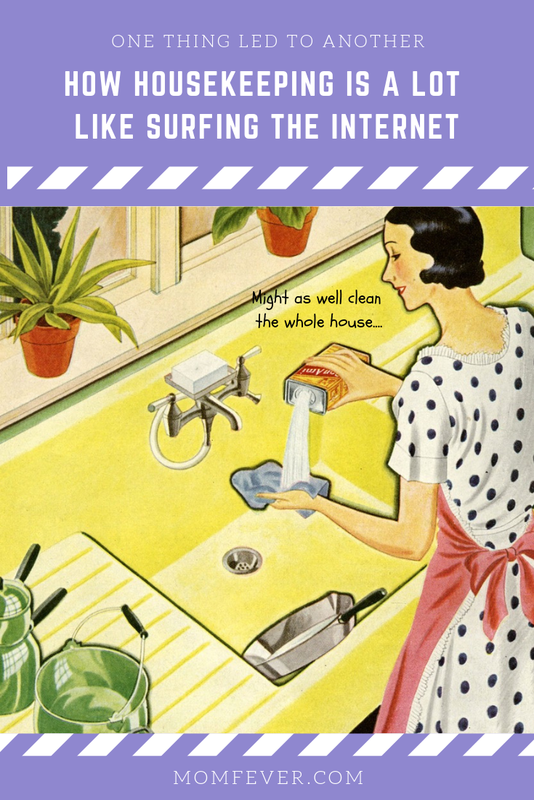 Have you ever noticed that housekeeping can be a lot like surfing the internet. One thing leads to another, and before you know it 4 hours have passed. Here's what happened to me. On New Year's Day I decided I might as well take down the Christmas tree. It was really starting to drop its needles, even though it's from very real plastic. But after I'd put away the Christmas tree, the spot where it had been was all dusty and dirty, so I decided to sweep it. Now that I was holding a broomstick I decided I might as well sweep the living room floors too. And once the living room was swept, I thought I might as well sweep the kitchen floors. But the kitchen floors contained some nasty spots, my broom couldn't get rid off, so I decided to mop the floor. I poured me a bucket of hot water and added a generous amount of cleaning solution. Because I always figure: 'If a little cleaning solutions helps, a lot helps even more.' Right?! I mopped my little heart out, and then I figured I might as well mop the living room floors too. To do that well, I figured I had to take out the carpet, and put the furniture aside, so I could get to those hard places where I seldom go. Before I knew it the living room was clean, and neat as a pin. Since my water was still usable I thought I might as well mop the floors of the kids' bedrooms. I dragged myself and my bucket up the stairs, and entered the bedroom of my eldest daughter. Clothes were strewn everywhere, so I decided I might as well collect them all, and do the laundry. After I had started the washer I came back and mopped her floor, after which I repeated the same procedure with the other bedrooms. Then, just when I said to myself: 'I might as well clean the windows,' fate mercifully intervened, and I stumbled over my little bucket and had to sit down to catch my breath. My near tumble brought me to my senses. Heaven knows where this would have ended! I might even had started cleaning the attic. I can totally identify with this! Housecleaning really can be addictive! I'm glad you only stumbled and didn't fall, that is for sure! Thank you for sharing, and for being a part of the Hearth and Soul Link Party. Hope to see you again this week. Have a great week ahead! Yes! This is so true. I recently saw someone who had written a parody on the "If You Give a Mouse A Cookie" book - it was "If You Give a Mom a Muffin" and it was pretty much this scenario exactly. Thanks for the chuckle (and reality check), and thanks for sharing at Sweet Inspiration! This made me smile, I am sure we have all been down this path, well maybe not as far as you went LOL. Maybe someone else will get a nice smile from this post so we will feature it on the next Blogger's Pit Stop.